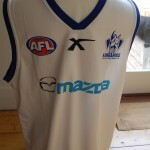 AFL Football teams have always played in their traditional team colours. With the advent of televised games, and games played at various times of the day and night it was inevitable that a variation on the humble football jumper, jersey, guernsey became necessary. Football commentators, fellow players, fans, watchers and listeners, unable to be at the game needed to be able to differentiate between the players of each club. Most clubs have adopted an away or clash strip. It uses their teams basic colours but also uses white, grey or expands on one of the traditional colours. 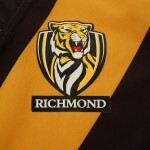 A good example of this are the Richmond Tigers football jumper, jersey, guernsey that has a greater use of yellow in their away strip than that of the traditional home guernsey. 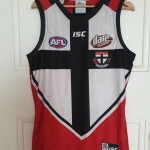 St Kilda Saints football club have employed a greater use of the colour white. 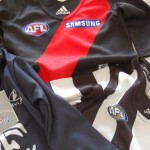 Essendon Bombers football club have incorporated the use of the colour grey into their away strip . 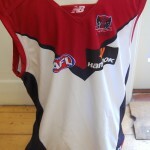 This entry was posted on Thursday, December 14th, 2017 at 8:18 am	and is filed under AFL, Carlton Blues, clash, Essendon Bombers, football guernseys, football jerseys, football jumpers, Melbourne Demons, North Melbourne Kangaroos, player, Richmond Tigers, St Kilda Saints. You can follow any responses to this entry through the RSS 2.0 feed. Both comments and pings are currently closed.